The Set is a 23-bedroom townhouse hotel with two restaurants, cocktail bar and ping-pong room centrally located in historical Regency Square with sea-views over the iconic West Pier. Original, relaxed and casual with a rustic and eclectic décor, The Set’s three British tasting menus are created using local suppliers and change with the seasons to be as sustainable as possible. 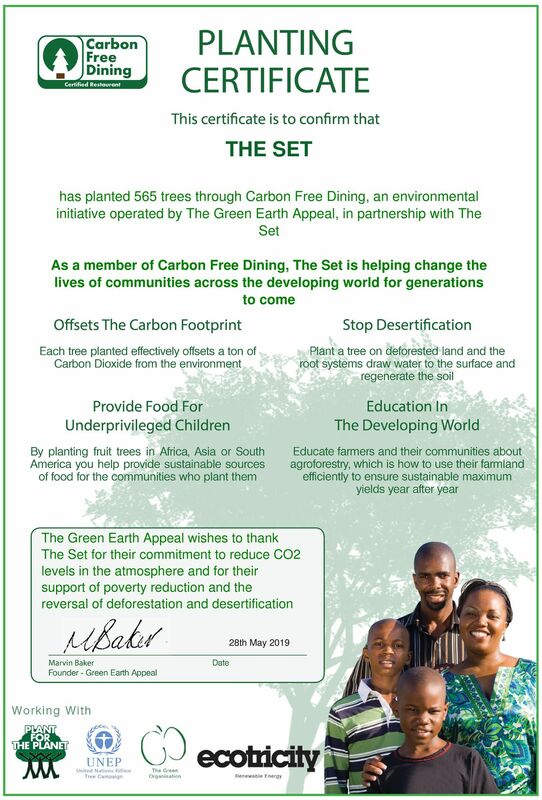 The team at The Set love their diners and the environment, and that is why they have teamed with Carbon Free Dining. For every bill presented at The Set, a life-changing fruit tree is planted in the developing world. Each tree will counterbalance the Carbon Footprint and Food Waste of the meals on the bill. Not only that, but they provide a sustainable way of life to some of the world’s poorest communities for generations to come.